Deep in the rainforests of eastern Peru, there exists a truly remarkable species of frog. 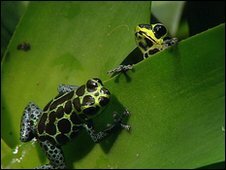 Ranitomeya imitator, the mimic poison dart frog, is the first amphibian ever proven to be completely monogamous. The depth of commitment between these frogs is simply breathtaking. The female will lay her eggs on the surface of a leaf, and the male will wait patiently for them to hatch. When the tadpoles emerge, the doting father places them on his back and, one at a time, transports each tadpole to a carefully selected puddle in the leaves of a bromeliad growing high up in the trees. He will watch over each of his half dozen children, waiting for signs that they are hungry. Whenever they need food he calls in their mother, who lays an unfertilized egg for each tadpole to eat. The amount of work these frogs put into caring for their young really shows how complex frogs can be. The most amazing thing about these frogs, in my opinion, is the level of commitment they have toward each other. Genetic testing of wild frogs shows that, unlike many supposed monogamous animals, these frogs almost never cheat on each other. It really is wonderful, to think of a pair of these frogs living out their life in the harsh jungle, totally committed to each other and raising their children. Perhaps we humans could learn a thing or two from their example. probably solitary and far from water..tadpoles are usually produced in the hundreds..great article, always something new to learn.. I just stumbled across your blog and I can't stop reading your posts. It's wonderful to know that there are a good handful of people out there who truly care about animals. Although, I will admit the lobster post made me feel bad because I love that and crab. Darn, I'll start weaning off of it now. Nice post, it impressed me.